You do like bananas don’t you? I certainly do. It’s pretty much one of the most perfect portable snacks you can find. I’ve been eating them since before I can remember. Literally. They pretty much fueled my way through my sports years as well. Yep, you might be surprised to know that I played basketball and volleyball. #25 baby. I loved playing sports. What I didn’t love, the energy drain and cramps during games. To work around that I would eat a banana at halftime and was good to go before long. Bananas are definitely nature’s original energy bar. rub a banana peel on your poison ivy or bug bites and it relieves the itching. you can polish your teeth or shoes with a banana peel. when you get your bananas home from the market separate them and they will last longer. when you run a frozen banana through a YONANAS machine you get a frozen treat that tastes just like soft serve ice cream! After a day of all things bananas we ventured out into the park! First stop DOLE’s Enchanted Tiki Room! After years of hearing about the legendary DOLE Whip to say I was excited to try this was an understatement. Swoon. I wish I would have gotten a photo of that swirly goodness but between trying to hold an umbrella (the one day it rains a year in California we were there LOL) chatting with the girls and inhaling it it just didn’t happen. Trust me if you’re there just get one. You’ll thank me. Then we got a personal tour around the park. Very cool. 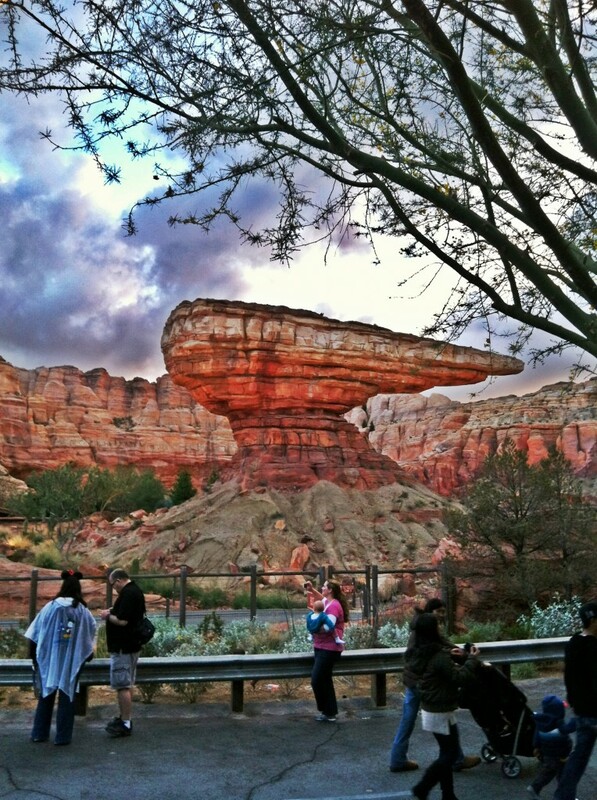 My favorite part getting to by pass the insanely long line in the Cars ride located in ridiculously realistic Radiator Springs. 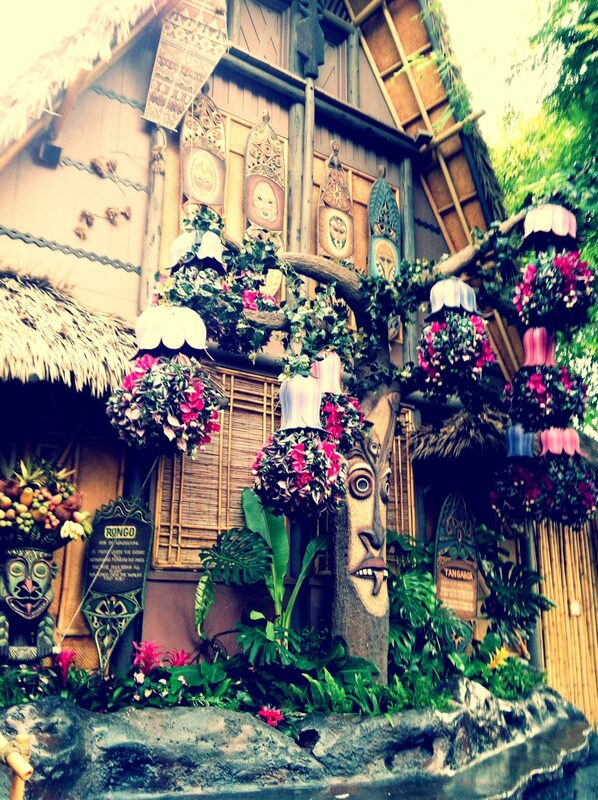 The magic of Disney is definitely in the details. They don’t disappoint. 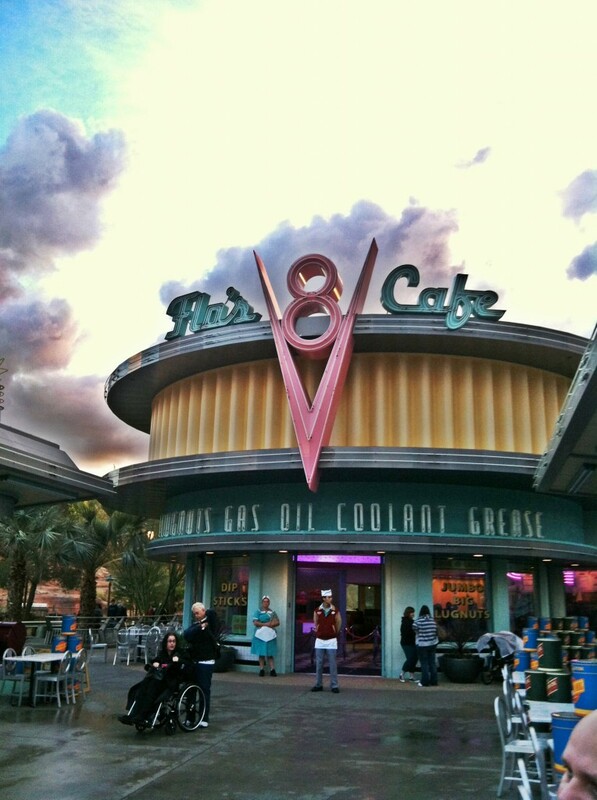 We didn’t eat at Flo’s Cafe instead we dined at Carthay Circle Restaurant. A very fine dining restaurant (yes in the park). Hands down, it was the best meal of the DOLE trip. Yes hands down. If you have the chance to eat there take it. Another good eat, the pizza at Napoli in Downtown Disney delizioso. Try it. You’ll like it. Now I shouldn’t be the only one who gets to have all the fun right? DOLE is giving one of you lucky readers a chance to win a yonanas machine! You’re kids will love this machine! Mine are crazy about it. Just remember to peel the bananas before you freeze them. I learned the hard way. 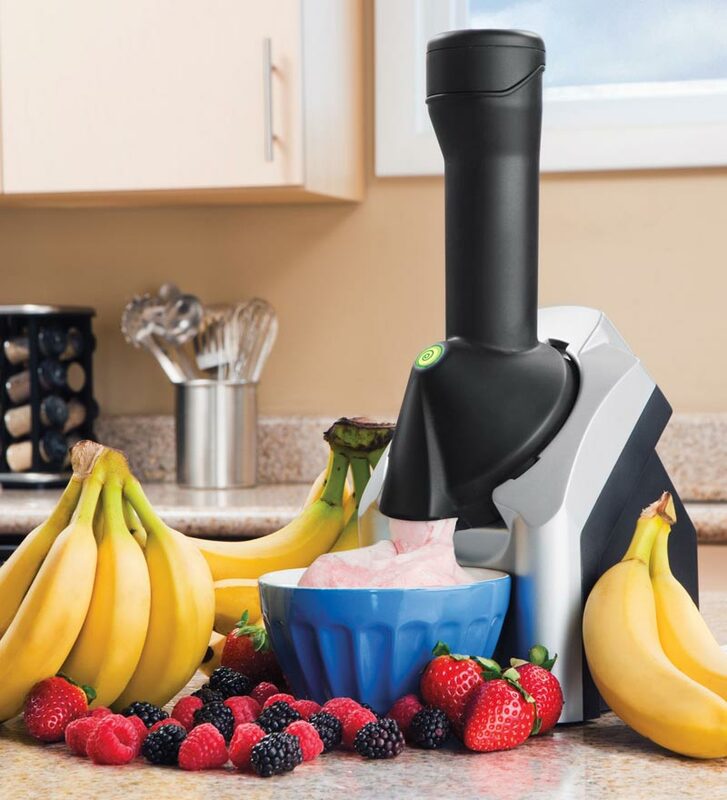 One Yonanas Machine – Make delicious, creamy, low-cost, healthy frozen treats in just minutes! A tip peel the bananas before you freeze them. Trying to get the peel off a frozen banana. Let’s just say not fun. Go bananas everyday with DOLE BANANAS! . Disclaimer: My trip was compliments of Dole. Opinions are my own. Always have been. Always will be. Dole provided me with a yonanas machine and is providing one bell’alimento reader a machine as well. I have a ripened banana sliced over my cereal every morning! I love it- like desert for breakfast! Peanut butter and banana sandwiches are the bomb! That was such a fun trip! So glad I got to see you again 🙂 bananas in my oatmeal for sure! I love frozen chocolate covered bananas soooo much! I love it best in banana pudding. PS – Cannot wait to meet you at Mixed this week! Hi Janet! That is such a great tip & one that they did indeed tell us about! I’m going to add it to the list above! Looking forward to meeting YOU too! Mwah! My favorite is bananas with nutella. I enjoys bananas just plain, by themselves. Or banana cream pie, mmmmmmm. Definitely in banana bread or a smoothie. thanks! I take a raw banana and smear it with peanut butter. Yum, banana cream pie for a splurge, but in smoothes they are great, too. I love a peanut butter and banana sandwich, toasted wheat bread! Aside from just eating banana’s I like banana bread. What’s not to love about bananas? 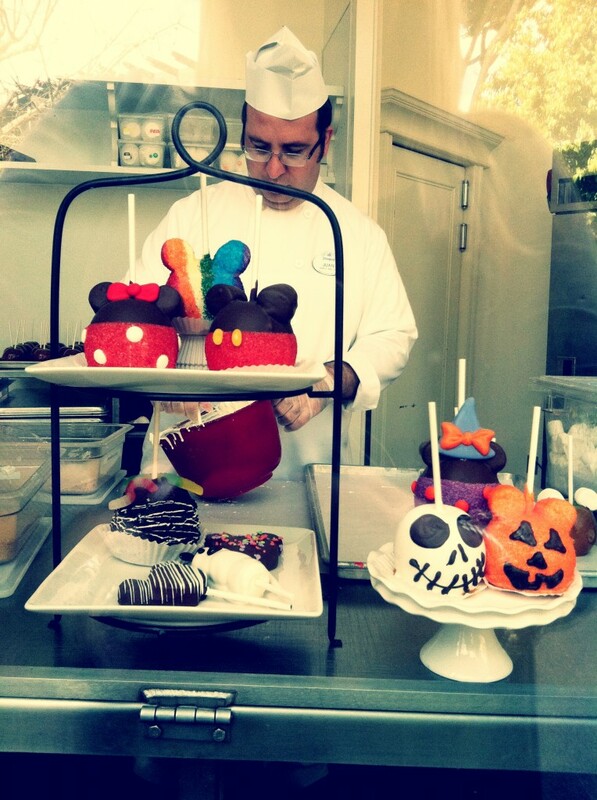 From slicing them on your cereal to dipping frozen bananas in chocolate…the perfect food! I like them sliced horizontally on warm toast with PB (smooth…not chunky). I love a sliced banana with peanut butter on toasted English muffin halves for breakfast. Yay Elvis! On peanut butter wheat toast. I like bananas by themselves and blended into smoothies! I like bananas by themselves. I have an absolutely fabulous Banana Cake recipe that earns me raves from family and friends. Love bananas. I like bananas plain, in a banana whip, smoothie, and sometimes I’ll eat them in a banana wrap with peanut butter. Those are a few of the ways I like bananas, but there are many more. Cut up on top of cereal with soy milk! Guilt free ice cream~ my vanilla ice cream… yum!!! Bananas are so versatile, everybody knows that. right” banana us a great way to start the day! Wow in Hawaii it’s known as a Mai’a…and we have so many different varieties and what a pleasure to go in your backyard and pick em off your tree…I prefer the small Apple Bananas I guess we’re blessed to have something than the Starchier Williams and other types of commercial Bananas sold in the Mainland. My Grandma used to make a dish called Maruya which was a banana fritter of sorts that was made with shredded sweet potato and regular white potato and mashed bananas mixed in a pancake like batter and deep fried and dusted with powdered sugar and served with Hawaiian Vanilla bean gelato….Oh the old hanabatta dayz!!! What a great giveaway! The trip looks so amazing, love the first picture! I like to have bananas in my morning cereal! My favorite way to eat bananas is in banana pudding! I love fresh homemade banana bread! In cereal or sauteed as a dessert with homemade whipped cream! I like making banana and milk smoothies. I love them frozen and covered in chocolate … or sliced on toast with peanut butter and honey. Mmm! I love enjoying frozen bananas blitzed in smoothies! I love to make banana bread and banana muffins. Bananas sliced thinly, on a thin layer of peanut butter. Elvis had the right idea.